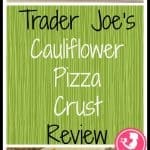 The pros: Trader Joe’s Cauliflower Pizza Crust is a good tasting and healthy alternative to regular pizza crust. This product is also gluten free. The cons: This is more expensive than buying pizza dough or fresh pizza crust or frozen pizza crust from Trader Joe’s. There is only one crust per box. Allergy information says there may be traces of milk which is a bummer for vegans out there. The verdict: Cauliflower is quickly becoming the new kale. For a long time now, riced cauliflower in the fresh produce area is one of the most frequently sold out items in the store. Riced cauliflower can be used in a multitude of ways. One way in which I’ve seen it used is in cauliflower pizza. 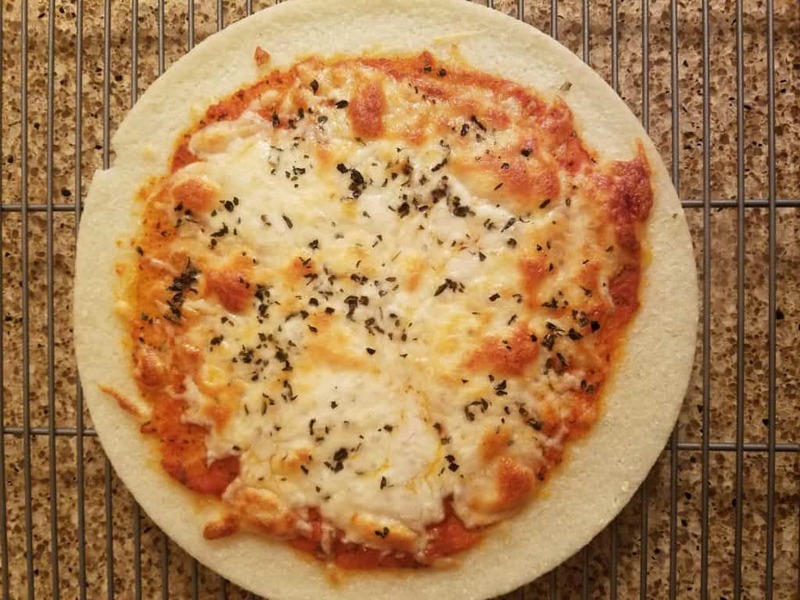 There are lots of cauliflower pizza crust recipes out there and very often they use cheese as a binder. That is not the case here. 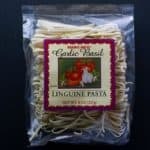 Various starches are used here and they are used well. I preheated my oven to 450F and cooked the cauliflower pizza on pizza stone with the traditional toppings of marinara and cheese. After 10 minutes I removed the pizza. The cheese was bubbling and the pizza was hot. When it had cooled enough I bit into it. While not an exact match for pizza crust, it was pretty good. 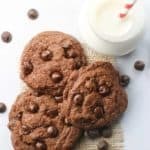 This is one of those healthy substitutes that you will know the difference, but one to which you might not mind making the swap. 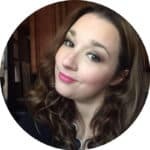 I had a friend in college who had Celiac’s. One of the things she always said was that she missed eating pizza. 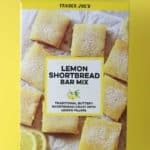 If you are gluten free because of a medical condition or by choice, this is a great selection in the freezer aisle. 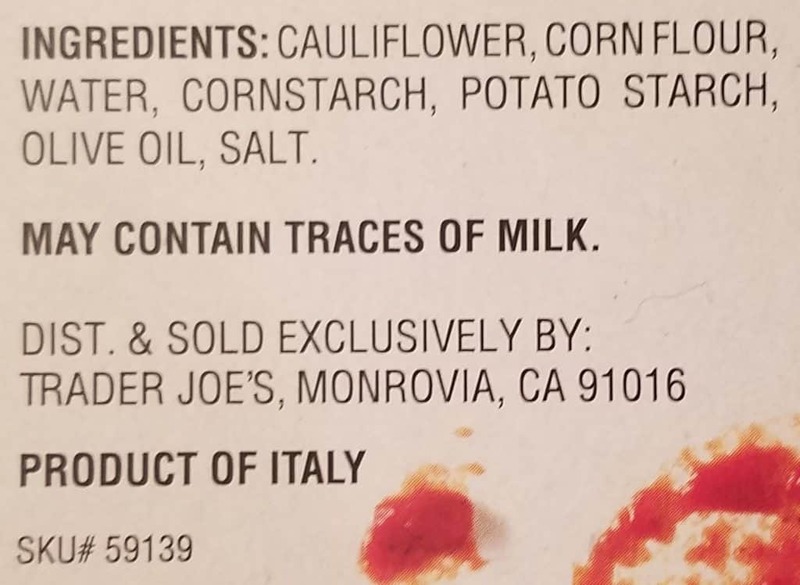 While I am bummed out that dairy might be present in the product, all the other ingredients seem to fit into a vegetarian diet. As for the taste, I wished I had gone past the 10 minute mark as I would have loved for my crust to be a bit crisper. 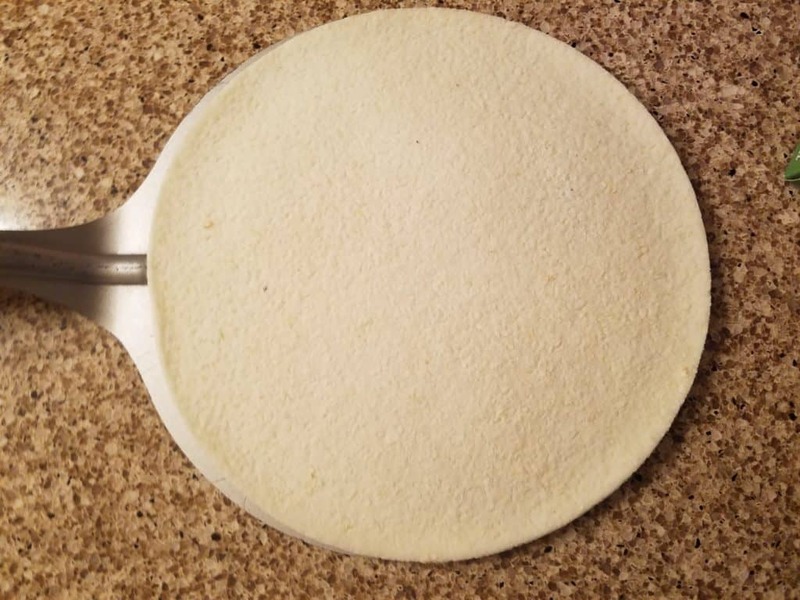 It would be tasty on its own as a “flatbread.” As a pizza, it was a touch softer in texture than regular pizza, but nothing that I wouldn’t eat again. There is a touch of cornmeal grit to this product as well. But that added texture was good too. After a bite or two I was able to adjust to the taste and really enjoyed this product. Also, based on the size of the pizza, it says six servings, but honestly you’ll get something closer to three out of this. For $3.99, this is pricier than most pizza crust options available. However, this is a bit of an exchange. 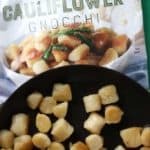 If you are looking to rid your self of gluten, excess carbs with pizza, cut calories without cutting much of the taste, then this is absolutely something you should try. As for me, I would absolutely buy this again. This is a healthier alternative to traditional pizza crusts. Truthfully, I would keep a few of these on hand. For me, this is worth the premium. I recommend this and think this product is worth a try. Would I buy this again? 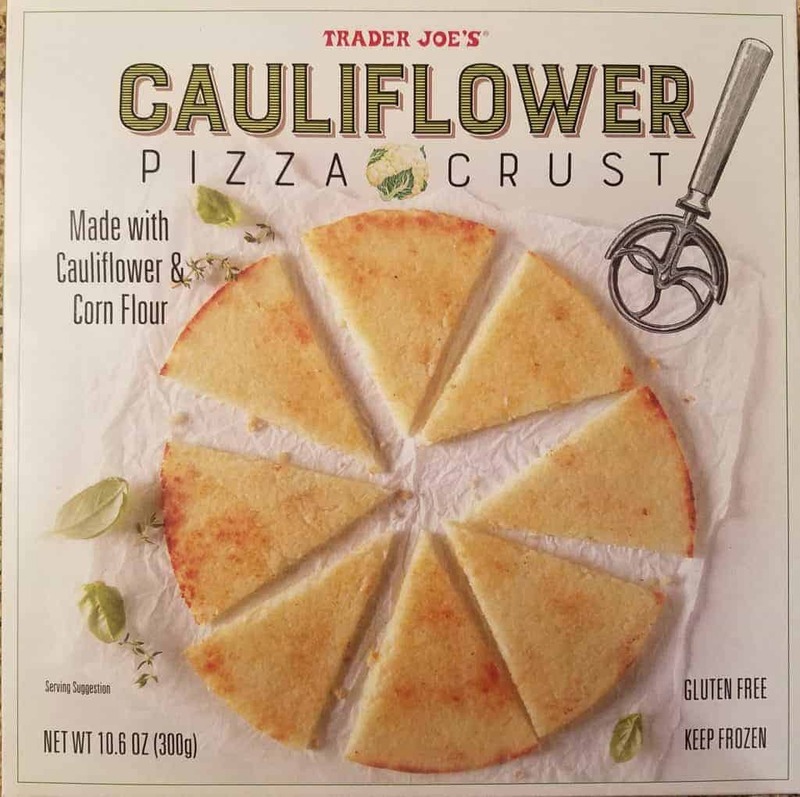 Trader Joe’s Cauliflower Pizza Crust gets a yes from me. While not an exact match to the taste of pizza crust, this is a healthy alternative that did not leave me feeling deprived of pizza. That’s certainly is a lot lower in carbohydrates the regular pizzas out there. I might just be going on a low carb diet again soon. Thanks for sharing! Since you are going to be low carb dieting, let me ask you this: is there a difference in carbs from veggies vs. bread or other sources? Any suggestions for brands who sell lower carb pizzas? I was comparing it against regular flour based pizza. I becomebetty. Most vegetables are pretty low in carbs, except some of the higher sugar and starch ones like carrots, peas, and corn. Generally I try to make sure I use more carbs on veggies and fruit (which have sugars in them) over starchy stuff. But if I do eat starchy stuff, I try to stick with the whole grains, since they usually have more fiber. When I count carbs, I count net carbs, which are the total carb grams minus fiber grams and any sugar alcohols. Low carbers often use cauliflower to substitute for things like potatoes, rice and even bread, in the case of that pizza crust. Cauliflower is low in carbs. I’m not sure about lower carb pizzas, but I am interested in the one made with a cauliflower crust. There are things like low carb tortillas and low carb bread substitutes. I can’t recommend any brands. Thanks so much for sharing this information. It’s very helpful. 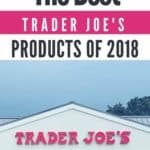 This crust sold out of both Trader Joe’s near me. I guess it is very popular! For a frozen healthy pizza crust, it wasn’t bad. It wasn’t as good on a reheat though. When you do get it, make sure to leave it in long enough to make it crispy. I went back and it was sold out. It wasn’t bad, but definitely doesn’t reheat as well as regular pizza though. Erica, I mentioned that point about it being closer to 3 real servings. Nothing wrong with real pizza. But for the gluten free crowd this wasnt bad in my opinion. Also, this was not made with any cheese which I know a lot of homemade recipes call for. Not sure which sites you mean. Thanks for sharing your thoughts.